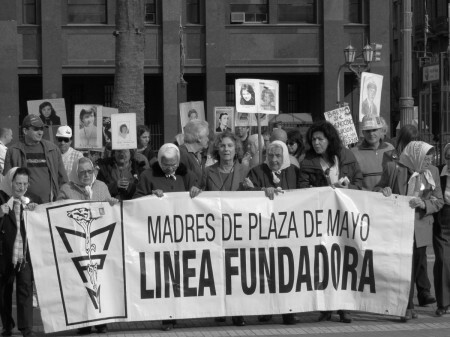 Witnessing the weekly protest of Las Madres de la Plaza de Mayo is one of the more enduring images of Buenos Aires. Founded in during the military dictatorship of the late-1970s as a reaction to the kidnapping and murder of their children, the Mothers haved marched round the Piramide de Mayo in the centre of Buenos Aires every Thursday afternoon at 3:30pm since 1977, each woman wearing a white headscarf with the name of their missing child embroidered upon it. Known as Los Desaparecidos (the Disappeared), some 30,000 Argentinians are believed to have been kidnapped, tortured and murdered in the 7 years of the regime, victims of the so-called Dirty War against left-wing activists. The Mothers have been the one voice (often the lone voice) of protest since the murders began, and in fact their founder and 2 others of the original 14 protesters were themselves killed by the military. Jorge Videla and the remaining generals responsible for the crimes were finally sentenced to life imprisonment in December 2010 after more than 30 years of fighting by Las Madres. They now continue what they see as their murdered children’s legacy and work closely with the government to help the living conditions of the nation’s poor and under-privileged. Below are some pictures from the weekly protest, click the photos to launch the gallery.